I'm doing a Q&A ! 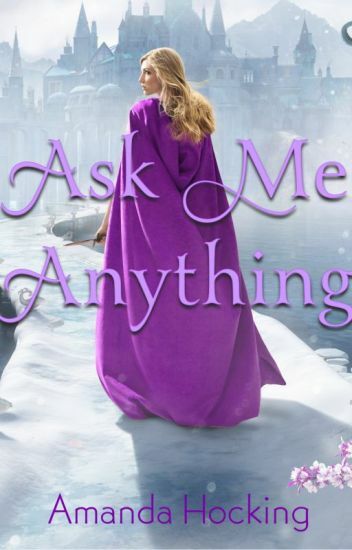 How it will work is from April 27th until May 3rd,  you can ask me anything - about Ice Kissed, if I prefer Ridley to Konstantin (or Konstantin to Ridley), writing in general, my favorite books, the publishing industry, Muppets, my dog Isley, whatever. Bonus: My five favorite questions will receive signed bookplates, because I love getting questions I haven't gotten before. Post your questions in the comments section below, then check back on May 4th to see which questions got answered. Just giving you a sneak-peek on the multi-million, global best-seller written by the amazing, Amanda Hocking! Hey! So this is like my 4th book. Please don't read this until you read the other two books before this called Frostfire(The First book) and Ice Kissed(The Second book). Also this is a The Kanin Chronicles. This book is about After Ice Kissed. What will Konstantin Black do to her? Will he hurt her? Well read to find out. Set five years before the events in the Kanin Chronicles, Bryn Aven is struggling to find her place in the secret kingdom of the Kanin—a realm as beautiful as it is treacherous. Born of mixed heritage, fourteen-year-old Bryn has never felt like she completely belonged. Now, with the summer sun thawing the frozen province, the yearly King's Games are about to begin, and an opportunity has arisen to squire for the popular guard, Konstantin Black. Now Bryn can prove herself and earn the respect she craves. With her best friend Tilda by her side, Bryn is more determined than ever to show the Kanin kingdom what she's made of. Preview of the second book in the trylle trilogy. Wendy everly has to chose wether she should follow her heart or protect her Kingdom.